Content marketing is more than just blogging. I hope you understand how it works. Content marketing is referred to as the entire process of creating content, publishing it on different online platforms, and promoting it wherever your target audience is. If you are into content marketing, you must know that it is a common practice to republish your old content on different platforms. To exploit and reach different groups of relevant target audience that reside on those platforms, such as LinkedIn and Medium. To drive more traffic than they would have otherwise received by just publishing those posts on their own blogs. However, there is a small problem with this technique. The possible issue of duplicate content. No, it isn’t something technical or too complex that requires a lot of explanations or examples. A duplicate content is just that — duplicate content. 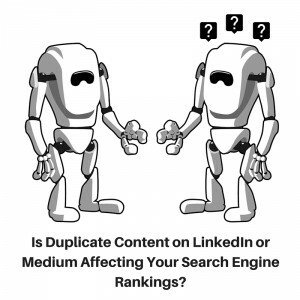 A piece of content that has been published on the web for more than once can be referred to as duplicate content. The problem with duplicate content is that it leads to plagiarism and a possible search engine penalty. As you must already know that Google — and all the other search engines for that matter — hate plagiarized or duplicated content. If a website is caught for copying someone else’s content, it won’t be ranked higher in the search engines. As a result, that website will not be able to receive free organic traffic from search engines — which is one of the most common and cost-effective ways of driving targeted traffic for most website and blogs. Now that you have the basic understanding of the background, here is the problem. Many content marketers republish their old content (that they have already published on their blogs) to other online platforms, such as LinkedIn or Medium. It is a proven method to extend a brand’s reach and drive more targeted traffic and potential new leads. But this process — while effective in generating traffic and leads — poses a problem of duplicate content and possible search engine penalties. That’s the question that we need to answer here. Ryan Battles did a research by publishing his posts on LinkedIn and Medium. Surprisingly, duplicated content — or search engine penalties — didn’t come into equation. The contents were exactly the same, but it didn’t affect the search engine rankings for his blog posts. In fact, his original articles were always ranked above the contents that he republished on LinkedIn and Medium. ”Having duplicate content will not penalize a website in any way, and it does not affect pages on the site that aren’t duplicated. So just because you have duplicate content does not mean your site will never see the light of day in Google, just those duplicate pages could be hidden way. Seems like good news, right? But you cannot be always 100% confident when dealing with search engines and its fabled algorithms, and how the search engine ranking factors actually work. So, it is always a good idea to act prudently. There are a few different ways that you can use to safeguard your website from potential search engine penalties. There should be at least a gap of 7 — 10 days before you republish a piece of content. Reword the entire article if you can. The time you spend on it may not always be worth it, but you will have to decide on it based on how big your audience is and how popular your particular topics are. Use canonical tags to ensure that search engines know which is the original article and should be given preference over duplicated or republished contents. Republishing content on other platforms is a good content marketing strategy that often drives more traffic and new leads. While the issue of duplicate content isn’t that big of a problem, it should be still avoided as much as possible. Use the techniques mentioned in this article to make sure that you stay clear of any possible search engine penalties. Content marketing is important. There is no doubt about that. However, the problem is that more often than not we focus so much on content creation and marketing that we completely neglect some other important aspects of online business. But you have to remember that an online business is much more than just content. You can build an online business on the back of content, but content itself isn’t business. And it takes much more than high-quality content to successfully start and maintain an online business. This blog post is a reminder for you to once again divert your attention to the other fundamental pillars of your online business. Here are some of very important things that you need to focus on other than content. Blogging is a tough job. To be honest, it often seems almost unfair. You work so hard on writing each blog post, but only a fraction of your target audience read it. The rest of them just skim through the content and do not read it all the way through. The irony of the online blogging world is that you may receive a lot of social media shares. But not everybody will necessarily read the text and keep scrolling down until it ends. It is now a proven fact that online users often share blog posts without actually reading the entire content. But here is the most important question. Making your blog visitors read entire blog posts is crucial — especially if you want to succeed from a business point of view. If they are not reading your contents, they aren’t going to subscribe to your email list, award you projects, or buy your products. In this blog post, I share a few proven tips and tricks that will encourage your website visitors to read your entire blog posts. 2015 is done and dusted. Hopefully, you had a good year as far as your content marketing strategy goes. But in 2016, you can seriously crank up your content marketing efforts and achieve significantly better results. The concept is rather simple. You need to create more profitable content in 2016. Too simple? Nope, it isn’t. Bloggers and content marketers focus on so many different things that they fail to concentrate on the most important aspect of content creation, i.e., creating more profitable content. In this blog post, we are going to discuss how you can create more profitable content in 2016. Creating a landing page is now easier than ever. You have simple drag-and-drop builder and awesome applications, such as LeadPages. But does it automatically ensure higher landing page conversions? There are lots of combinations of different elements that are used to create a landing page. And all of them should be perfectly optimised and geared towards higher page conversions. But, if despite your best efforts, you are having poor landing page conversion rates, then you will have to take certain steps to rectify the issue. Yes, it can be difficult to pinpoint where the exact problem lies, but there are some steps that almost always lead towards progression. In this post, we discuss what you can do when you have poor landing page conversions. It does not matter what you do. Sometimes, it just doesn’t work. No matter how good your blog posts are, sometimes they do not bring you the desired amount of traffic. Even after weeks of publishing the post, you can’t see any backlinks, mentions, comments, social media shares, or traffic visitors. It’s common. If this sounds familiar to you, it is the perfect time to ask the question: What else can you do to change it? You see, there are many things that go into the making of the perfect blog post. But most of all, it requires patience, consistency, and a lot of hard work. However, you gotta start somewhere, right? In this post, I explain 5 hacks — proven ways — that you can use to bring more traffic to your blog posts.